Although the Jeremy Piven footage was filmed earlier in the day, I do believe that it may be tied into the Have/Have Not competition that was held just an hour or so ago. The "have nots" are Jeff, Lydia, Michelle, and Kevin. Russell also won $10,000. I believe all of the "haves" also get to watch Piven's movie. Speaking of Russell, he knows he's in trouble. 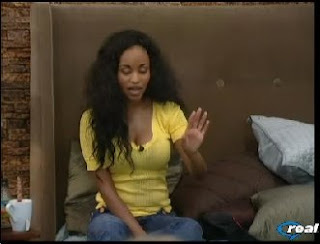 Chima just brought Jordan into the loop, and she has promised that she will vote to evict Russell if that's what Chima wants. We'll see if that happens, especially as Jeff has promised Russell he'll pull him down if he wins veto. Ooooh, Jeff and Russell's conversation just turned interesting. Jeff asked Russell who he would vote to evict - Jessie or Natalie. Russell replied that it would be Jessie, as he's made it personal by making a big deal about the money he won (Jessie also apparently won money, but of course that's different). Jeff's response? "You just have to have hope that things will change...nothing is official until it's official"
Nominations will be happening soon. Read today's other posts - Chima brought Jordan up to HOH and she promised to do what Chima wants.